Nearly a century ago, in 1922, Vladimir Lenin delivered one of the most memorable speeches of his life, reassuring his fellow Bolsheviks that even amid the reforms of his newly announced New Economic Policy, the Soviet state would not relinquish control of the “commanding heights” of the economy. By this, he meant those sectors considered so critical to state survival and success that a particular degree of control and coordination was necessary. In the early 20th century, this meant energy, mining, heavy manufacturing, and communications. Today, nearly 20 years into the 21st century, many of Communism’s core tenets may have been disproven, but it is striking how the commanding heights largely remain the same, and are simply reinventing themselves amid new trends and challenges. Consider, for example, the global energy transition, one of the most simultaneously predictable yet complex phenomenon that the global economy will have to grapple with over coming decades. The spectre of climate change necessitates a shift to more sustainable societies, as made abundantly clear by the recent UN Intergovernmental Panel on Climate Change report issued last year, not to mention the mounting body of scientific evidence published by authorities around the world. Residents of the Gulf are no stranger to this reality, and indeed the ongoing Abu Dhabi Sustainability Week is the single largest gathering in existence today aimed at addressing this very challenge. This would be a challenge of historic proportion, and a story of great interest, even if global efforts to address it were completely synchronised and coordinated. But the fact is that, in a warming world, geopolitics are alive and well, and the global energy transition is replete with great power politics and technological competition. The clean energy race is vibrant even in the heart of those companies and countries that hold the lion’s share of remaining oil and gas reserves. The Italian oil company Eni turned heads last year by investing in a nuclear fusion company that was spun-out of labs at MIT. The UAE’s Masdar shocked the energy sector in late 2017 with its record-setting bid of 1.79 cents per kilowatt-hour to develop a large solar project in Saudi Arabia that it is developing alongside French partner EDF. And petrodollars deposited into the sovereign wealth funds of oil-producing states are being recycled back into clean energy assets around the world in increasingly large sums. All of these moves are not charity, nor simply branding. They reflect the new geoeconomics of the energy transition, a world in which low-carbon means big business. Consider, for example, that 2018 was the ninth successive year in which global clean energy investment was over a quarter of a trillion US dollars. Renewable energy now accounts for around 70 per cent of annual net additions to global generating capacity. The best performing commodity of 2018 was not coal, natural gas, or even palladium; it was instead credits in Europe’s carbon market. Each credit represents a ton of carbon dioxide emissions avoided or removed from the atmosphere, and the value of such credits nearly tripled over the course of last year. Even areas without explicit carbon pricing mechanisms, from Abu Dhabi to Wyoming, are increasingly finding valuable uses for carbon dioxide before it can reach the atmosphere, whether in enhanced oil recovery, concrete, or even to produce clean fuel. Looking ahead, those controlling the global economy’s commanding heights are no longer only those with the resources, the countries pumping oil, mining coal, purifying silicon, and forging steel. In today’s age of big data, power increasingly rests in the hands of those capable of wielding data to increase the efficiency, security, and flexibility of modern energy flows. From artificial intelligence to blockchain to quantum computing, new digital innovations are increasingly poised to re-shape many energy sector dynamics in a ways that are likely to be consequential though unpredictable. As energy systems become more interconnected not only among themselves, but also with other commanding heights such as transport and communications networks, the risks of cyber vulnerabilities or cascading failures are poised to increase. And, when it comes to the climate challenge, innovations that aid cleaner resources are often equally suited to boost traditional fossil fuels. Prudent policymaking will be needed to guide new innovations in the direction of increased sustainability, and to harness technological competition for the greater good. Taken together, these trends point clearly to an energy sector at an inflection point. Facing the imperative of climate action, the rise of new renewable resources, and the imminent introduction of disruptive digital technologies, board rooms and government cabinets cannot afford to act as if it is business as usual. The question, however, is how key leaders will respond to these upheavals. Will they seek greater state control of the commanding heights of energy? Will they leave these dynamics to the invisible hand of the market and its innovative potential? Or will they seek a middle ground between the two? As the gravity of global energy investment, including clean energy investment, moves increasingly to the East and to emerging markets, these questions could not be more timely. 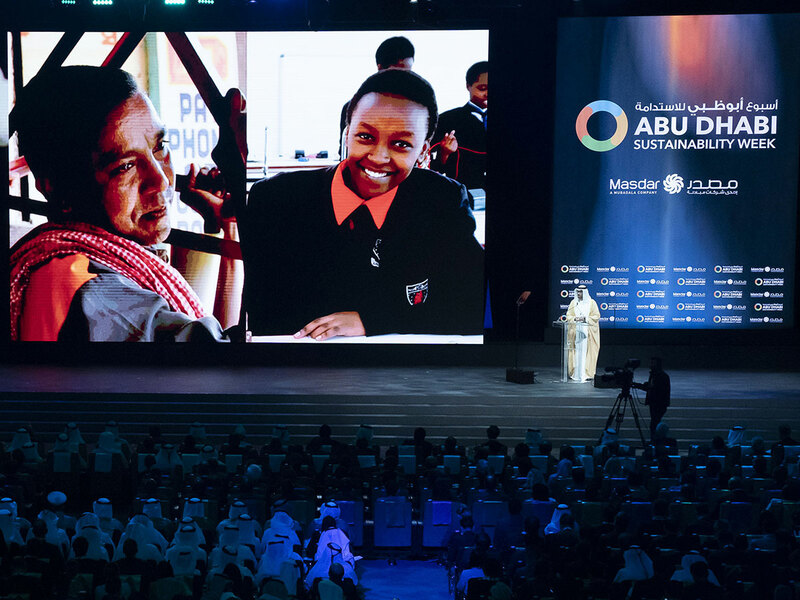 Amid the ongoing Abu Dhabi Sustainability Week, these questions will be at the front of many minds, and will help to set the global energy agenda for the year ahead. David Livingston is deputy director, climate and advanced energy, of the Atlantic Council’s Global Energy Centre. His work focuses on energy, economics, technology, and climate change.